SKILLED RGV is a vehicle system that has been created from the same project as that for the Laser Guided Vehicles (LGV’s) and its operation is therefore based on the same general principles. The vehicle drives along a straight rail at floor level, being used only and exclusively for movement in straight lines. 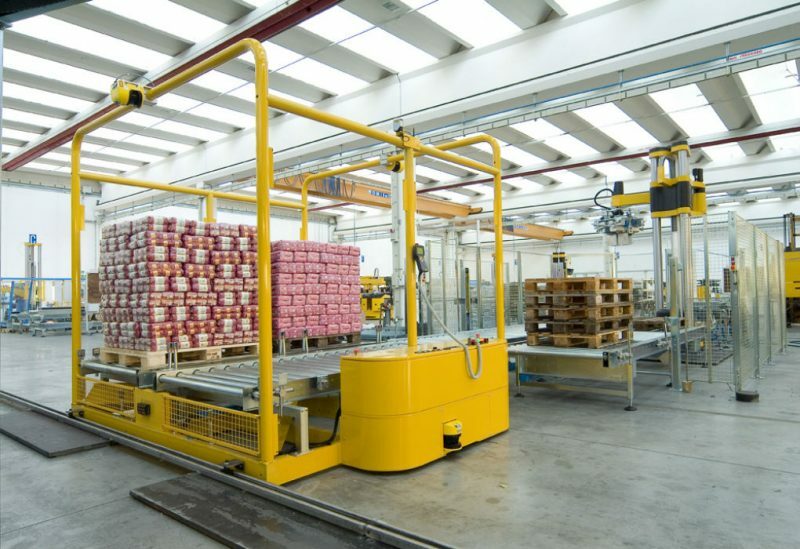 Its integration with SKILLED ROBOTS palletisation systems makes it possible to achieve complete end-of-line automation, with considerable cost savings and assured increases in production management efficiency. Complete pallet handling towards wrapping and/or storage with simultaneous automatic feeding of empty pallets and slip sheets to the palletising cells. Modular system, bringing great flexibility should enlargement be required in the future. The absence of electrical connections and the possibility of sinking the rails into the floor make access to the production lines easy for operators and vehicle drivers. Perfect compliance with the safety laws and standards in force.